Arizona Comic Mini Expo brings the best comic creators out for Free Comic Book Day. Mesa, AZ – The valley of the sun is welcoming the very best talents in the state for the first annual Arizona Comic Mini Expo on May 5, 2012. 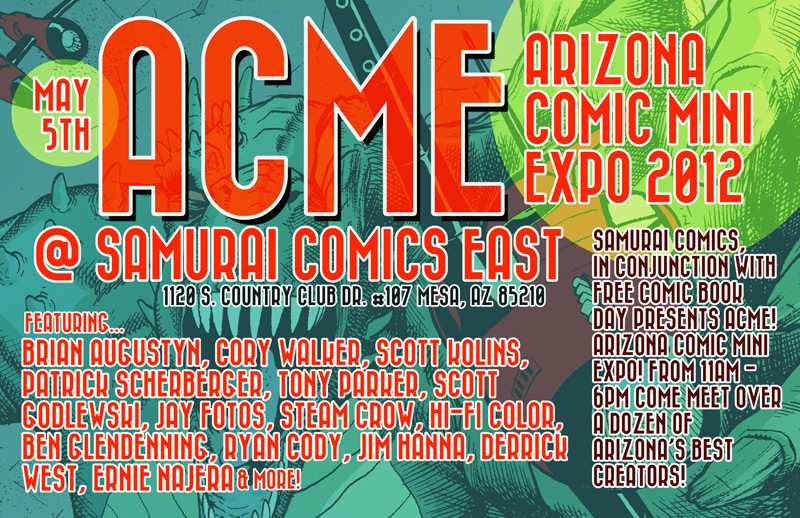 ACME is a one-day event being held at the Samurai Comics location on Country Club and Southern in Mesa. There is a wealth of comic talent in the Phoenix area and ACME takes advantage of that, boasting the best lineup in the Southwest. Inaugural guests include: former Flash writer and DC Comics editor Brian Augustyn; Invincible co-creator, Marvel and Image Comics artist Cory Walker; Marvel and DC artist Scott Kolins; Spider-Man artist Patrick Scherberger; Aspen Comics artist Tony Parker; Boom Studios artist Scott Godlewski; Image Comics colorist and creator Jay Fotos; Marvel and DC colorists Hi-Fi Color; Dan & Dawna Davis, authors and illustrators from Steam Crow; Image Comics and sketch card artist Ben Glendenning; Viper and Image Comics creator Ryan Cody; and self publishers and independent artists Jim Hanna, John “Dadicus” West and Ernie Najera round out the guest list. 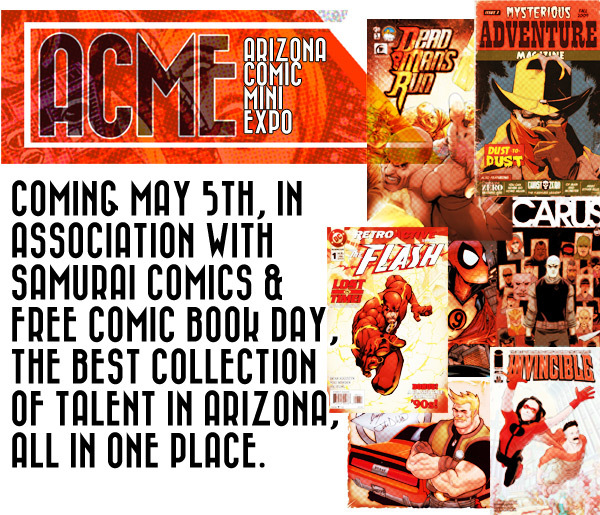 In addition to the event on May 5th, ACME is hosting a gallery event on Friday May 4th at Gotham City Comics in downtown Mesa. Original art by many of the guests will be on display as well as a unique live art event that will benefit the HERO Initiative. Guest announcements! Brian Augustyn, Patrick Scherberger, Tony Parker and Cory Walker! Keep an eye on the Guests page, many more still to come!